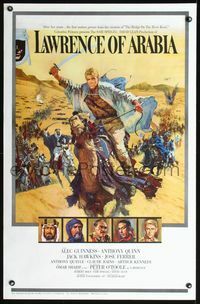 3a001 LAWRENCE OF ARABIA pre-awards style 1sheet '62 David Lean, best art of Peter O'Toole on camel! Important Added Info: Note that this classic movie was released at the end of 1962, to qualify for the Academy Awards. Two different styles of one-sheet posters were created for that "pre-Awards" release, and then after it won seven Academy Awards, two new one-sheets were created, both referencing the Academy Awards that the movie had won. The pre-Awards one-sheets are far more rare and far more desirable to collectors, because far fewer examples of them are known to exist, and they are among the most desirable of all 1960s posters! The poster offered here is the pre-Awards "camel style" one-sheet (it does not have a style letter on it). Note that I (Bruce Hershenson) went to visit mega dealer Walter Reuben in 1990, and at the end of our visit, he showed me an example of this poster, and he said "Bruce, I think this will be the very first poster from the 1960s to sell for $1,000"! This seemed absurd at the time, because, at that time, few 1940s or 1950s posters sold for over $1,000, and most collectors could not imagine a 1960s poster selling for even several hundreds of dollars. Of course, later that year, I held my first major auction of movie posters, and, at all my future major auctions, I always wanted to include an example of this poster, but it is INCREDIBLY difficult to obtain, and it has always eluded me, until now! Condition: fine. The poster was in excellent folded condition. The collector who owned it wanted to frame it on his wall, and he wanted it to look in as perfect condition as possible, so he gave it to a top restorer, and had them press the poster flat, and perform the tiniest of touch up to the foldlines, so that it would seem to be completely unfolded on his wall! This really is a magnificent poster, and I certainly hope that whoever purchases it will also display it on their wall!